Coachella here I come! It's finally time for Weekend 2 of the highly anticipated arts & music festival. 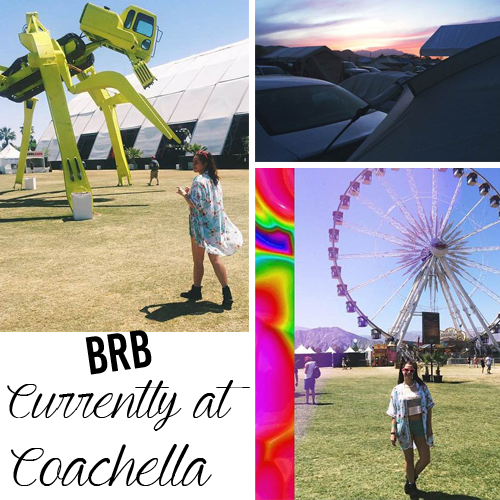 Follow me on my journey because I will be updating this post LIVE throughout the fest! I will do my best to keep this going throughout the three-day experience. Check in on the blog every few hours to see what updates I've made. + 3:02 a.m - I'm up. I'm groggy but up. Final packing moments then we're off to Indio! + 3:51 a.m. - We're leaving San Diego! + 3:53 a.m. - Never mind. Now we're getting gas. + 4:10 a.m. - En route to Indio! 101 miles to go. + 5:51 a.m. The sun is starting to rise! I love those cotton candy skies. Just a few miles away now. + 6:10 a.m. We're in the car camping line! Yay! + 6:24 a.m. Just heard a girl ask her friend "wanna start drinking after I put my makeup on?" I'm too old for that. Haha. + 8:12 a.m. - The car camping line is moving; waiting to get checked by security. It's hot already. + 10:06 a.m. - We are almost done setting up camp. Our next-door camp mates offered us a nice cold beer which we accepted gratefully. + 11:23 a.m. Fred & I have been drinking water because it's already nearly 90°. Currently checking out the information booklet they gave us upon arrival. Free blowouts & updos at the Beauty Bar & Barber Shop y'all!!!! + 1:24 p.m. - Woke up from a much-needed nap & now walking & exploring the camp area. + 2:26 p.m. - Some girl rode past us on her bike saying "I hate you. I hate you. I hate you." & then squirted us with her watergun. + 6:48 p.m. - We just woke up from a second nap. It's been brutally hot so most of the day has been spent finding shade & drinking water. + 8:18 p.m. - You have no idea how much more comfortable it is now that the sun has set & it's cooling off. Night & day difference. Literally. Currently making chili Ramen & we finally cracked open a beer. + 10:51 p.m. - Just found out about the recycling program on the campground so we might take up the offer of collecting cans & water bottles. We went to the activity center & charged our phones but now we're back to the campsite to wind down. + 12:35 a.m. - Enjoyed a couple hours with our neighbor & had some Jamison. Bedtime. + 8:48 a.m. - We woke up & rejuvenated ourselves. Now eating breakfast which is eggs, veggie sausage, & broccoli with cauliflower. + 11:41 a.m. - We took an amazing shower using a bucket of water & soap. It was so refreshing & necessary to rejuvenate ourselves after a very hot first day. We turned in our cans, so far we have 96. Currently getting ready to head out for the day. + 12:04 p.m. - Just entered the fest. + 12:43p.m. - We made it for Sheer Mag's set. I found an AIR CONDITIONED bathroom which was heavenly. Got Afters ice cream: Cookie Monster Milky Bun. Amazing. + 1:38 p.m. - Jackfruit nachos are a thing & they're delightful. Currently at the Frances show; she's lovely live. + 3:40 p.m. - All right all right all right. We saw Lapsley & she seriously rocked! Wow! We just finished watching the HEALTH set from up front at the barrier! Currently making a pitstop at our camp site to re-up on ice cold water & have our first beer of the day. + 11:59 p.m. - Oops time passed. We saw Foals, ASAP Rocky, Ellie Goulding, & LCD Soundsystem. We had lavender Earl Grey & double blueberry donuts. I told Fred I didn't think they were worth the price but he disagreed. + 8:50 a.m. - We put our canopy back on. Hopefully, the wind won't be as terrible. We certainly saw our fair share of dead & damaged canopies. We're tidying up our tent & campsite. Fred's allergies are flaring up with all the dust & black boogies are definitely a thing for everyone. Our dry ice has been a miracle worker & kept our water & food nice & cold. Highly recommend. + 1:28 p.m. - We made some breakfast of eggs, refried beans, broccoli & cauliflower, veggie sausage, & a crappy homemade version of sorbet to cool us off. We took another campsite shower, bought some ice, & now we're trying to stay hydrated. It's 84° but feels much hotter. 12:36 a.m. - I apologize for the lack of updates on Saturday but I was just enjoying the moment. Some of the highlights were: catching part of Deerhunter, AlunaGeorge, Vince Staples, a bit of Grimes, vegan Jamaican food, Guns N Roses, Ice Cube who brought out Dr. Dre at & Kendrick Lamar. Such a good day. + 6:19 a.m. - Someone's alarm went on & hasn't been turned off in several minutes. Woke up & went outside. It's a joy to have some brisk temperatures in Indio, if only for a moment. + 7:38 a.m. - Hello from the Connected Lounge. I'm updating this on an ancient laptop; it should be in a museum. Charging our phones here as well. + 11:08 a.m. - We took a refreshing bath/shower this morning & made some breakfast. I got a piña colada smoothie & Fred💖 got an iced coffee from one of the camp vendors. Our next-door neighbor campers left this morning because their tickets were invalid because they were scammed. Very unfortunate. + 4:14 p.m. - Started off the day with De Lux then PRAYERS. Both were great. We caught Joywave then ate a churro. Now Wolf Alice. + 7:48 p.m. - A wave of exhaustion hit me, so I'm back at the tent trying to take a little nap before Sia. this sounds amazing! have fun, cant wait to see pics! Ooh so exciting, hope you have tons of fun! It is a great idea to keep a journal like this! yayy! hope you have so much fun! Sounds like fun! I love camping and I love music so this would be an awesome experience. Can't wait to see more! JEALOUS! Have a blast! Can't wait to see more updates! This seems like sooo much fun! Can't wait to see the pictures, wish I could be there! Oh my gosh, what early wakeup times... but I'm sure it was so worth it! So jealous!!! I really wish I could go to coachella! I made a inspired look of it and you can check it out! Wonderful news :) I wish you had a great time there hun! Can't wait to see more photos! So jealous you got to go to Coachella. Its a dream festival for me to go to. Sounds like you had a fab time! WOW I am so jealous! I will go to Coachella one day!!! Love how you have really documented your experience. great post.